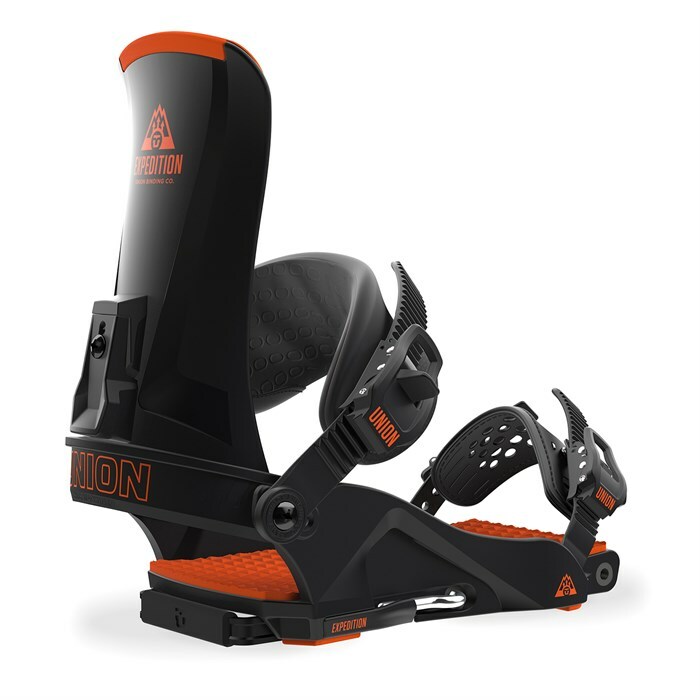 New for 17/18, the Union Expedition Snowboard Bindings are the result of a bomber inbound binding company taking their expertise into the splitboarding realm. Union went with a pin system, but placed the pin through the center of the baseplate to give maximum connectivity and response when you want to ride. The Expedition also gets a specific touring highback with a one-turn forward lean adjuster for quick transitions, making this an efficient and powerful new addition for your splitboard setup. Duraflex ST SP1 Base  Once injected with Duraflex ST Nylon, SP1 Expedition base becomes an even stiffer, backcountry access machine. Developed and rigorously tested by non other than Travis Rice and Bryan Iguchi. Synthetic EVA 3.0 Bushings  Shock absorbing synthetic bushings are durable and an outstanding compliment for the smooth, natural ride of the SP1 base. 3D Symmetric Ankle Straps  Direct Connect System locks you in with zero strap elasticity. The Multilayer Core inside provides supreme comfort, and confirms across the top of you foot. Magnesium Ratchets  This Union exclusive process produces a material 4 times stronger than aluminum with only 1/2 the weight. Plus magnesium is easily recycled and remains the eighth most abundant element on the planet. Symmetric Duraflex Highbacks  Designed specifically for touring, Expedition Highbacks feature an adjustable quick-snap forward lean adjuster that goes from tour to riding mode with the flick of your fingers.